Review Summary: Simple, catchy synth-pop that brings back memories of the Super Nintendo. Featuring vocalist Alice Glass and multi-instrumentalist Ethan Fawn, Crystal Castles really made a name for themselves with their self-titled sophomore release. Sporting seventeen full length tracks spanning over an hour long “Crystal Castles” is like a party that never comes to an end. Right out of the gate “Crystal Castles” reminds me of a soundtrack for a cheap, old school NES game. Nearly every track on the album is littered with polished keyboard buzzes and retro samples. “Crimewave” and “Knights” consist of simple, catchy beats backed by lively video game sounds. Vocalist Alice Glass adds a hypnotic feel to the music whether she is harshly shouting or merely speaking over the nintendo-core madness. Listening to “Crystal Castles” in one sitting is a challenge. Although the intensity of the keyboard induced madness is catchy it gets tiresome. Towards the end of the album every track starts to blend together; songs such as “Reckless” and “Vanishing” just become monotonous with their generic melodies and harsh sampling. At times things just get ridiculous, the high-pitched beeping noises and shouting on “Loving and Caring” is a cluster*** of violent sounds that is anything but danceable. It’s no doubt that “Crystal Castles” is an enjoyable listen yet it loses its replay value quickly. The upbeat yet intense atmosphere of the music can be catchy and groovy but the album recycles the same sound over and over again until it is drilled into your brain. The dissonant Nintendo-esque effects are charming at first but wear off as the album moves along. 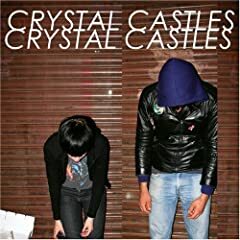 In the end “Crystal Castles” is definitely a fun listen just don’t expect something highly experimental or interesting. do you ever read your reviews before you post them? i like the small doses of this band i've heard, but i can't really imagine listening to an hour plus of it. they are really hyped up though, i guess. Perfectly written to my opinion. Good review. I like the album alot though although I can see where you're coming from completely. You caught my sentiments exactly. I really enjoy this bands music but in low doses. This band gets way too much hype from where I'm from. The album is as interesting as the bands interview manner. I like how the guy refuses to answer questions about how he stole the atari chipped keyboards idea. How did he steal it? Tried getting into these guys, as much as I enjoy the old school Nintendo and SNES sounds, I find it's too spaz-tasic for me.